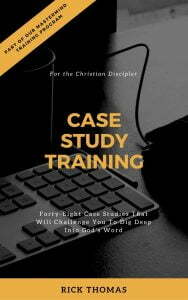 Case Study Training – Forty-Eight Case Studies That Will Challenge You To Dig Deep Into God’s Word (12,500 words) – Our Mastermind course trains Christians to become compassionate and competent disciplers. The program is in three parts. The foundational piece is theology–the study of God. What we know about and how we think about God is the bedrock upon which we build our Christian lives. Theologically precise Christians can live well in God’s world. But they need more than theology. Bible knowledge can lead to arrogance, as well as functional ignorance, which is why our students receive more than sound theological training. We teach them psychology too. Psychology is “psyche logos,” or the “study of the soul,” or the “Word concerning the soul.” We also call this sanctification, the application of theology to our lives. It’s imperative that our students know how to connect God’s Word to their souls, as well as the souls that they serve. But we don’t stop with theology and psychology. We give our mastermind students more. Too often discipleship training does not get into the nuts and bolts of real lives. This problem is where the third phase of our training excels. We want our students to push beyond the study of God and the study of humanity. Our students are required to “make it real” by bringing their training to everyday situations. There are several ways that we help them do this, one of which is our Case Study Training. Over their two-year course, each student is required to complete one case study every two weeks. There are forty-eight of them altogether. The case studies are approximately 250 words, and there are two to five questions for them to answer for each study. All of the mastermind student’s case studies are in this book. There are no answers provided. The student provides the answers. The burden is upon each student to take the case studies to God and then write out how they believe they should counsel the individuals in the studies. This book is an excellent training tool for the Christian discipler. It is perfect for small group discussions and equipping, as the small group leader leads the members in the practical details of Christian discipleship. This book is also ideal for counselor training because it will challenge the student to go beyond counseling theory. Without question, the hardest part of our program is the case studies. Christians enjoy reading about theology. They also love reading about counseling theory, or gaining knowledge from our terrific “counseling authors.” But when it comes to “doing the work of discipleship,” the level of difficulty grows exponentially. We want our students to have more than fantastic Christian knowledge. We want them to know how to connect their theologically-based knowledge to real lives. These case studies help accomplish that goal. If you think you might be interested in our mastermind training, please contact our organization. It would be a pleasure to explore that possibility with you. As you are thinking about that option, please share our case studies with your friends. Talk about how you’d “counsel” the individuals presented in the next forty-eight pages. Use your “iron” to sharpen your friend’s “iron” for the glory of God.